The truth about the Euro-Demonstration 2010 in Brussels (29 sept) or what medias and union traders don’t want to talk about: arrestations of pacifist demonstrators, police violence, infiltration of policemen among demonstrators, preventive arrestations, intimidations of independant journalists, collaborations of union traders with the police… The police state in EU. 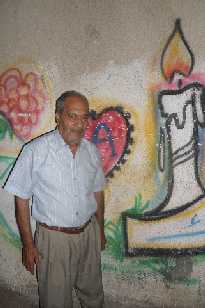 This is the life story of Jum’ah Arouq (Abu Akram), 67, a 1948 refugee from Hamama village living in Gaza. “Who reads what you write? The Jews are afraid of those who write. They have killed Majed Abu Sharar [in Rome], Ghassan Kanafani [in Beirut] and… and… and they have almost killed Bassam Abu Shareef [in Beirut]… you can remember better than me! “I swear! I swear by God! They forced us to leave in 1948… I swear! I swear by God! We did not abandon our village voluntary! It is the truth! I remember every single detail like I see you now. I was 5 years old. “Write! I’m Jum’ah Hassan Arouq, from Hamama village. I was born in 1943. When the war started in Palestine in 1948 we heard boom! boom! and airplanes and shots. We left our home and we went to our orchard… not only us, all the inhabitants of the village went to their orchards to take shelter under the trees. “We remained there for some days… two or three days… but we were afraid the airplanes would come to bombard the orchards too. So we left… We wanted to go to Gaza. “We stopped in a small village near El-Majdal called El-Khasas. We spent there two or three days under the trees. We had with us three or four chickens from our orchard. My father killed them and we ate them. “I was with my parents… my father was 40… three sisters and three brothers. No, there were only two sisters… the third one was born in Gaza later! One sister was 1-year old and the other one 8. My brother Mohammad was 3-year old, one was 11 and the oldest Ali was 18. We didn’t know where to go… We were scared by the airplanes and the bombings. “When we left Hamama my parents took a cow, its son and a donkey, three or four blankets, some food and three or four chickens. The children were put on the donkey. “Do you know where was Hamama? Do you know where is El-Majdal? It is called Askalan by the Jews. Hamama was located some five km to the north of El-Majdal… or perhaps more. “I cannot tell you the day when we left… the month… At that time I was 5-year old or 5 and a half, I didn’t know what was September and October. It was maybe in June or July but I’m not certain… or maybe in May. I remember it was not cold and not hot, maybe it was spring or autumn. “Came the Jewish soldiers in El-Khasas. There was not what nowadays is called Israel. We only knew there were Jewish soldiers. ‘What are you doing here?’ ‘ We are afraid of the war.’ ‘You should go to El-Majdal otherwise we will shoot you. Go! Go!’ We said OK and we left. “Many Majdalis had already fled. Many houses were empty there, in El-Majdal. We found a lonely old woman in a house, from the family Masawabeh. Her family had already escaped to Gaza. We stayed with her one or two weeks… I don’t remember exactly. “It was around 8 a.m. My mother had a clay tray… like this bowl, but it was very large. She had cooked rice with shariya… how do you call it in English? Shariya… very thin broken spaghetti… rice with small spaghetti. And it was very hot… So my mother was pushing the rice with her hand towards the edges of the tray. She was moving the rice like this… you see! “The soldiers said: ‘You should go!’ Outside there was a donkey and a dog. They shot dead the donkey and the dog. We left… We had no time to taste the food cooked by my mother! “We went to El-Majdal Square. Give me a pen… where can I write? This was the Square. Here there was an area on the right and here an area on the left, both enclosed by barbwire. ‘Where do you come from? From El-Majdal? Go to the right! From Beit Daras, Jura, Hamama? Go to the left!’ They asked the Majdalis to return home… and they brought trucks, not buses, big trucks for the transport of cows and animals and they pushed us in the trucks and deported us to Gaza. “Two or three km to the north of Beit Hanoun the dropped us on the road and they said ‘Go to Gaza!’ Among us were elderly who couldn’t walk. Strong men had to carry them on their backs. At a certain point there was a broken bridge in Deir Sneid village. We had to go down and to go up. Now Deir Sneid is in Israel. “Once in Beit Hanoun we didn’t find a suitable place to stay. We continued to walk towards Gaza City. We reached Gaza and my father searched for some accommodation. He found one… but it was not a house… it was the public Turkish bath. There we met my uncle with his family and with one blanket for the children. We had left our three or four blankets in El-Majdal! We arrived in Gaza with absolutely nothing, only the clothes we were wearing and at that time the clothes were very bad. During the night one child was pulling the blanket toward him and another child was pulling the blanket toward him! I swear! It’s the truth! “Do you know where is the Turkish bath? Not far from the Gold Market in Ez-Zeitun. It is still functioning nowadays… It belongs to the Samra family. We slept inside, on the floor. “In the morning where to go? We couldn’t remain in this place. We heard there was a forest. We went to the forest and many people went there too. Where there is El-Ansar today, Thalatini, the Islamic University, where was El-Muntada of Arafat… The forest covered all this area from the beach to Ez-Zeitun. “People cut trees and built some shelters to protect us from the sun. Who? The refugees! They used the wood to make fire for cooking. A number of them sold wood to make some money, even to the Turkish bath! And they build shelters for the families too. “My oldest brother Ali and my father returned to El-Majdal. They came back the same day with the cow, its son and the donkey and half a bag of flour. What to do with the animals? We sold them to buy some food. I still remember the price of the donkey. Do you know how much? We sold it for 50 piaster, that is half a pound. The cow and its son were sold for 25 pounds. “It was extremely dangerous. Scores of refugees tried to return to El-Majdal or to their villages to retrieve some belongings, some clothes, food or gold or money. In every refugee family they can tell you at least one or two or even three were killed. One of my uncles was killed. A cousin lost his sight and his fingers when he fell on a mine. Some people had not the courage to return there. They paid others to go. It was very dangerous. “We remained a month or so in the forest, not more. My father then went to down town Gaza and bought a tent and we erected the tent near the [old] port. Two or three weeks later the UN gave us a new tent and they started to distribute UN food to the refugees. “For the 1st class I went to school near Firas Market. You know where is Firas Market… Every day we were going on foot to school from the Beach refugee camp distant 4 or 5 km, and we were barefoot. The name of the school is El-Imam Esh-Shafihi. All of us were children. I was 6. “A couple of years later a new school was opened, it was called Er-Rimal. At the beginning the residents studied in the morning and the refugees after 12:00 because there were not enough schools. Today it’s called El-Carmel School… near Esh-Shawwa Center. This was my new school. After another two years they moved us to a newly built school in En-Nasser St, near the Swedish Clinic, the New Gaza Preparatory School. “In 1970 we returned to visit Hamama. One year after the 1967 war the Jews let us go wherever we wanted. Before we reached our orchard I said to my small brother Mohammad: ‘Now, we will find a tree called sycamore in our orchard!’… because I wanted to show him I was still remembering. And the sycamore was there! The orchard was like before… but not a single house remained in the village! The place was full of threes and bushes. You would never believe if you saw the place that once stood a village there. “In our village only two or three houses were made of stone, the rest were made of mud and clay. In El-Majdal, the houses were in stone. The orchards were to the east of the sea and the village 2 km to the east of the orchards. In our orchard we had grapes, figs, tomatoes, cucumbers, melons, watermelons and berries. In Hamama many were fishermen. “We never returned to our village. My father passed away 20 years ago and my mother 22 years ago. My father build many shelters in the Beach camp. “My oldest brother Ali was killed in Rafah during the 1956 war [when Israel occupied for a number of months the Sinai and the Gaza Strip]. He was a soldier in the Egyptian army [in a Palestinian battalion]. Plenty were killed at that time. 14, because we could make good money with the Swedish and the people were very poor at that time. In the same period I got married with the daughter of my uncle… I was obliged… I was not like today! “The Swedish troops were based in El-Ansar. I opened there a small shop of souvenirs, a bazaar, and I sold fruit too. In the Strip came also contingents from Norway, Denmark, Finland, Indonesia, India, Canada, Brazil. Every six months they left and fresh troops came. They were controlling the border with Israel. The Canadian and Brazilian forces were based in Rafah. The blue helmets remained in Gaza till 1967, they were called the United Nations Emergency Forces. Their HQ was in Abu Khadra in central Gaza City. “Abu Khadra was destinated to be a hospital, but he has never been a hospital. When the UNEF departed in 1967, the Jews seized Abu Khadra and it became their HQ. “In 1965 I enrolled in the Palestinian army and my brother Mohammad replaced me in the shop. It was called Jesh El-Tahkhir El-Falastini, the Palestinian Liberation Army. Till 1967 I was in El-Arish, Khan Younis and Rafah. We were called also the soldiers of El-Shoukeiri because at the beginning Ahmad El-Shoukeiri was the head of PLO. Following the 1967 war Ahmad El-Shoukeiri left for Lebanon and there was no anymore Palestinian Army in Gaza [which fell under Israeli military occupation]. “I escaped to Egypt by sea with a number of soldiers. I left in Gaza 5 children, 2 boys and 3 girls. Afterwards, due to certain problems, the Palestinians soldiers were sent to Lebanon and Jordan and after being called the soldiers of El-Shoukeiri they were called the soldiers of Arafat. I returned to Gaza in 1969 with the Red Cross. “From Gaza many Palestinian soldiers fled in 1967 to Egypt on foot or by sea like me. The Jews gathered the Gazans and asked where were the soldiers. The soldiers were captured and sent to Egypt. Some were able to return only after 18 or 20 years. “I worked in Israel in the building sector from 1971 to 1975 or 1976. I rapidly learnt masonry and the Hebrew language. I build scores of houses in Israel, in the Beach camp, in Jabalia camp, in Sheikh Radwan. “When my father and brothers worked as fishermen from 1953 to 1960 our living conditions improved. We had plenty of fish every day at home, in addition to the money. They returned from the sea with 5 to 10 kg of fish. We couldn’t eat all, we gave it to our relations and even we sold it. Every day they fished 2 or 3 tons… all kinds of fish. Now we cannot buy it. It was good fish and good money. At that time the fishermen can go after El-Arish in Egypt and till Port Said… 5 km before Port Said. I went there to fish for a time. “Now the Jews are on the sea. Nobody can go here or there. It’s a prison on the sea. A few days ago a fisherman was fired at on the chest and died shortly afterwards. “I sold my mini-grocery in the Beach camp and also my house which was very small and 18 years ago I bought a plot of land on the outskirts of Jabalia town. I built this house myself with my son Amin: the ground floor and 3 stories, each one with two flats. “All my children are now married. I have seven boys and seven girls. The boys live in this building with their respective families. At present, here, I have 28 grandchildren. In total, I don’t know how many grandchildren I have… they are over 80. “My wife Um Akram passed away two years ago. After two months I married a young lady from El-Majdal. She is now 35. Yes, she is beautiful, but she is very difficult!!! “I don’t know exactly my age. When we left Hamama we didn’t take any papers with us… not only us, all the people. I know I was born in 1943 because they said my cousin was born the same week. Once a teacher asked me my date of birth. I said 1944 and since then in all my papers it’s written 1944, but actually I was born in 1943. We had no birthday certificates… no birthday parties… Now we celebrate the birthday of the children! “I experienced four wars in my life: 1948, 1956, 1967 and the latest one in early 2009. That time, at every bombing, we expected our building to be the next target. The danger was coming from the sky, the sea, the ground, the border! “The most beautiful time in my life was when the Swedish troops were in Gaza because I was young and I earned money. I had many friends among them. I saw them when they departed on the first day of the 1967 war. They were waiting for a boat at the [new] harbor. They were taken to Lebanon. I was a soldier at that time and was coming from Rafah. “When my father and my mother didn’t find their home and the whole village of Hamama in 1970, what could they say? In 1948, they expected to return after one month or after a long time… something like six months. We are still waiting after 60 years… no, now 62 years! It’s enough! “The Return… I don’t know… It is up to Allah… We hope, but it is very difficult… The Return! Nowadays we are afraid they will drive us out of Gaza!! “Now Israel discusses the fate of the Arabs in Israel [the Palestinians citizens of Israel]. What’s his name? What’s his name?… Lieberman! [the Israeli MFA] He wants to transfer the Arabs of Israel to the West Bank! “In El-Majdal, in 1948, they told us after five minutes we will be back. When will end these five minutes? After 500 years? Were we terrorists at that time? “The international law says everyone should defend his country. We have done that and they call us terrorists. What can we do?… This is America… America says OK for everything Israel wants! “There is something else… I’m surprised by what is happening in the world. I know that the UK people, the French people, the Swedish people are good peoples, like the west in general. They love Law and Right and they have spread freedom in the world. So why do they agree with Israel? This is the problem! Israel is a lawless state and the irony is that the west supports Israel! I don’t understand! – Flora Nicoletta is and independent French journalist living in Gaza. She is currently working on her fourth book on the Palestinian question.